Got a pile of problems shaped like a hot tub? If you just need a general idea of what it might cost to fix a portable hot tub click the link below for a complete breakdown of the most common portable hot tub problems and typical repair costs*. Just like an old car, your old hot tub can eventually cost more and more every season just to keep it running. Don't get soaked pouring buckets of money into a portable hot tub that can hardly hold it's own water! 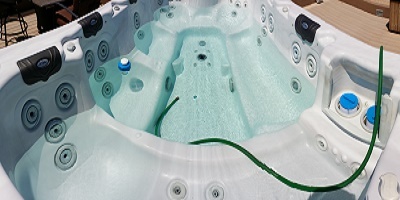 Schedule a $95.00 Troubleshooting, Testing & Inspection visit to get a complete evaluation of your portable hot tub before you spend money on parts and labor! Find out if it's worth fixing before you spend money on repairs. 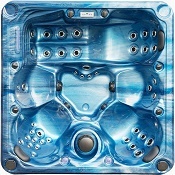 *Free hot tub repair estimates are for information purposes only and do not constitute a binding contract. Actual cost may vary. Certain limitations apply. Schedule a $95.00 Troubleshooting, Testing & Inspection visit for guaranteed repair estimates. 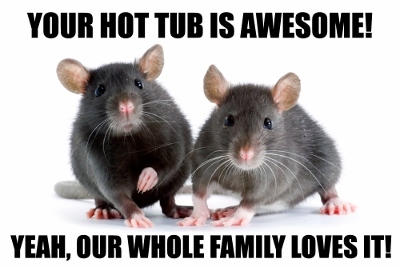 Click to see Hassle-Free Hot Tub Repair Estimates! Click to read our Yelp reviews! Spend a little. Save a lot. Avoid hot tub hassle! You can hire any hot tub repair company in town for a simple estimate but that only tells you how much it will cost to fix a particular hot tub problem. Simple estimates don't tell you if your hot tub is worth fixing or if your money will be well spent. 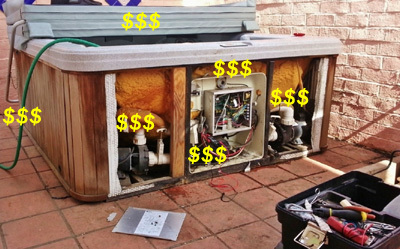 How much will it cost to fix your hot tub today? How much will it cost to keep your hot tub running in the next few years? How long before you have to pull the plug on your old tub and haul it away? 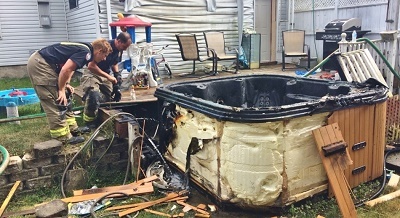 Variables such as chemical damage, federal safety laws, obsolete equipment, out-of-business manufacturers, multiple equipment problems, rust, rot, mold and rodent damage can all add up to hot tub that isn't worth fixing. 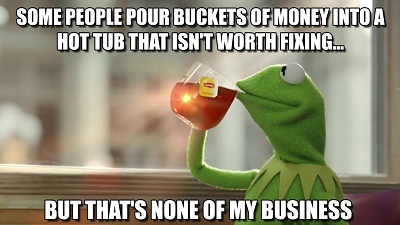 Don't pour buckets of money into a portable hot tub that isn't worth fixing! 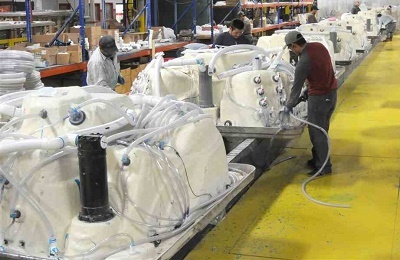 Your "portable" or "self-contained" hot tub was built on an assembly line like every other household appliance and it has a similar useful lifespan. Just like an old dishwasher, clothes washer or refrigerator, your hot tub will eventually reach a point where it costs more and more money every year just to keep it running. In just one or two seasons, you can easily spend enough money patching up your old, worn out hot tub to justify buying a brand new tub that comes with a new warranty and a new 15 to 20 year lifespan! Find out first if your whole hot tub is worth fixing. Don't shovel piles of money into a hot tub shaped hole! Small, prolonged leaks deep inside the cabinet of your portable hot tub can slowly rot out wooden frames from the inside. By the time you see rot on the outside the inside is usually beyond repair. 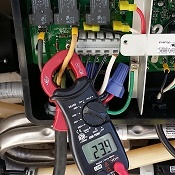 Schedule Quarterly Hot Tub Service to help prevent electrical fire hazards. Under ideal conditions two rats can become 15,000 in just one year! A female can have up to five litters per year and each litter can produce 12 to 14 new rats that are each ready to breed at 5-weeks-old! Pour an ounce of prevention into your hot tub every three months! Click to ask your neighbors about us on NextDoor! What do you do if the color doesn't look right or the cover doesn't fit right??? 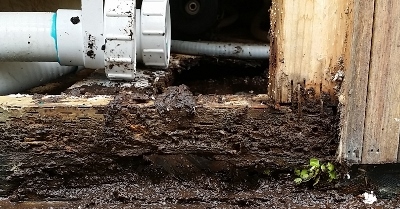 Even if your new on-line cover fits right and looks good... You still have to haul the heavy, waterlogged, moldy, stinky, dirty, falling-apart, old cover out of the backyard and somehow get rid of it. Let us do the dirty work! We take all the hassle out of ordering a hot tub cover! 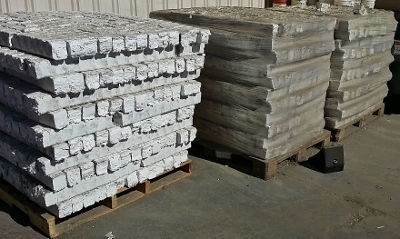 We remove the polystyrene (Styrofoam) cores of your old hot tub cover and recycle them at EDCO in Lemon Grove. The large, Styrofoam cores are put in a compactor and compressed into tiny blocks and then recycled! You don't have to worry about your old hot tub cover sitting in the landfill for a century or somehow polluting the environment with plastic micro-particles. We even remove the aluminum support rails (and sometimes D.I.Y. hinges) and recycle all the metal parts at Miller Metals in El Cajon. 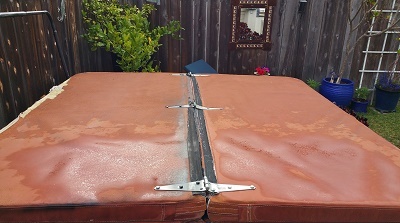 The only part of your old cover that will end up in the landfill at Miramar is the outer vinyl skin which is usually paper-thin, falling apart and already decomposing into dust before it leaves your backyard! 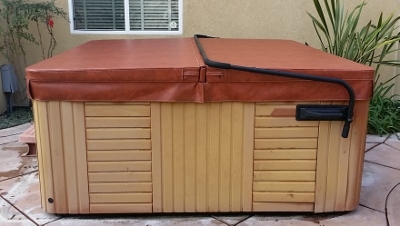 Hassle-Free Hot Tub Covers are manufactured right here in San Diego County so you're also supporting local workers at another local small business. *Must purchase new cover to qualify for free removal & recycling. Actual price may vary based on cover size, options and delivery distance. 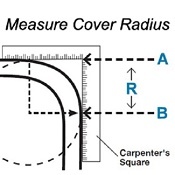 Click to ORDER a Hassle-Free Hot Tub Cover! Yeah...let that soak in for a minute. Sounds too simple doesn't it? Even here in San Diego with "some of the higest water rates in the country" you can still drain and refill a 400 gallon hot tub with a fresh, clean batch of water for about $2.96! Most portable hot tub owners are frustrated with complicated, expensive chemical systems with sometimes confusing or contradictory advice on how to use them. Just because you can fix a water problem by adding more chemistry doesn't mean you should. You can replace the entire batch of water in a typical portable hot tub for less cost than a single pint or a single pound of any product designed to treat the water! Worried about your water bill? A typical single-family home in San Diego uses around 83,000 gallons per year and pays $5.540 per Hundred Cubic Feet (HCF) of water. One HCF = 748 gallons. $5.540 / 748 gallons = $0.0074 per gallon! A typical, portable hot tub holds around 400 gallons. 400 gallons x $0.0074/gallon = $2.96 ! Even when you include sewer rates, a whole batch of water is cheaper than any pint or pound of product sold to treat the water. 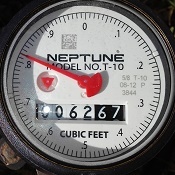 Click to see San Diego water rates and calculate hot tub refill cost! You can pour more money and more products into your tub so you can soak in more chemicals or you can drain the whole complicated chemical mess out and refill with fresh, clean water for about $2.96! Portable hot tub 'Two Buck Chuck Rule': If it costs more than $2.00 in chemistry to fix a hot tub water problem you might be better off just chucking the whole batch down the drain and starting over with a fresh batch of water. Even your time is worth more than a whole batch of hot tub water. You can fix a hot tub water quality problem with several doses of chemistry over several days if you have time for that and don't want to soak yourself until the water is fixed. You can also just drain and refill a typical, portable hot tub in one or two hours so the next time you soak yourself will be in a clean, fresh batch of water rather than a big bucket of expensive hot tub chemicals. 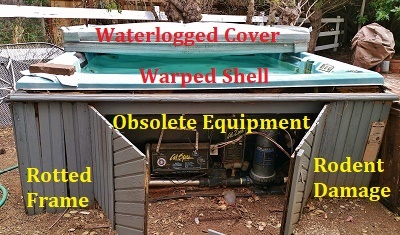 Your covered, portable hot tub doesn't actually use water! Your tub stores, filters, sanitizes and recycles water so you can use the same batch over and over again for weeks or months. Every other water-using appliance in your home dumps the whole batch of water down the drain after just one use. Showers, bathtubs, toilets, dish washers, clothes washers and every single sink drains every drop directly to the sewer after each and every use. Your covered, portable. hot tub is essentially a sealed tank that stores, recycles and maintians a single batch of water keeping it clean and sanitary for weeks or months. Your tub is the only appliance that automatically recycles and filters the same batch of water every day so it's always clean, sanitary and invinting whenever you walk out and lift the lid to soak yourself. You can simplify hot tub chemistry, avoid spending money on unnecessary products and greatly improve your soaking satisfaction if you simply drain and refill your hot tub every three or four months. When you drain your hot tub, the water actually weighs more than when you filled it! Think about it: When you get to the bottom of a 2 lb container of any solid hot tub product (powder, granular, tablet, etc) you have deliberately dissolved 2 lbs of stuff in the water. Every pint, quart or pound of everything you add to the water leaves behind chemical byproducts that eventually build up as "total dissolved solids" added to the water. As total dissolved solids build up, water balance and water clarity are much harder to manage. 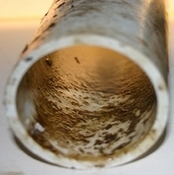 The accumulation of chemical byproducts begins to cause undesireable and unstable chemical reactions especially when you turn on the jets and disturb the water to take a soak. The only way to eliminate Total Dissolved Solids in your hot tub is to drain it out and refill it with a fresh batch of water. Complicated hot tub chemistry can include shock stuff, waterline stuff, oxidizer stuff, sanitizer stuff, cloudy clarifier stuff, crusty scale stuff, calcium stuff, cleaner stuff, pH stuff, scum stuff, foam stuff testing stuff. That's a lot of stuff! 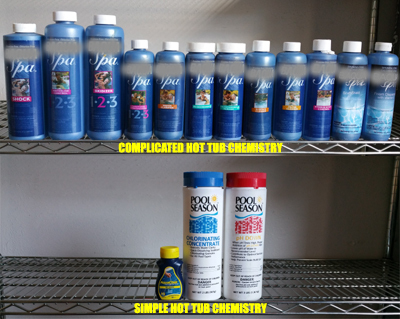 Top shelf: $150.00 worth of complicated hot tub chemistry. Would you rather soak yourself in $150.00 worth of complicated hot tub chemicals or $40.00 worth of Simple Hot Tub Chemistry and $2.96 of fresh water? An old batch of water in your hot tub can become saturated with chemical byproducts making it difficult or impossible for you to perform simple tasks like balancing pH or keeping the water clear. Every pint or pound of product you pour into your hot tub increases total dissolved solids and chemical byprodcuts so complicated chemistry systems with a dozen different products can quickly turn your hot tub water into a chemical brew. When you soak yourself, the hydromassage action of your hot tub jets rub off body oil and dead skin and the hot water makes you sweat up to 3 pints per hour so you leave behind organic byproducts every time you sit and soak. When you get up in the morning, every bit of lotion, cologne, perfume, deodorant and other 'personal products' you put on your body ends up in the hot tub at night unless you take a shower before every soak. The longer you simmer, sweat & soak yourself in the same pot of hot water the more it resembles people-flavored-stew. Don't waste your time pouring more and more chemistry into your tub trying to fix people flavored stew! When in doubt, drain it all out and start over with a fresh, clean batch of water! When in doubt: Drain it out! Simple Hot Tub Chemistry starts with the idea that a clean, fresh batch of water is usually the most effective and efficient way you can solve a complicated water quality problems in a portable hot tub. You can run to the supply store and buy yet another bottle of something designed to fix a particular water quality problem or you can dump all the problems down the drain at the same time and start over with a fresh, clean batch of water. You still need to test and possibly adjust pH and sanitizer levels before each soak but you dump the whole $2.96 batch of water down the drain and start over as soon as the water becomes even a little bit 'complicated'. Simple Hot Tub Chemistry: When in doubt, drain it out! Click to learn more about Simple Hot Tub Chemistry!